UPDATE: We had a slight change in plans for our beta key drawing. We're now giving away 5 keys on Facebook today and Thursday; Twitter will be tomorrow and Friday. We apologize for the confusion. Throughout this week, we'll be giving away MoP beta keys to 20 lucky WarcraftPets members! Beginning tomorrow, we'll give away 5 beta keys courtesy of the good folks at Blizzard. We'll alternate the giveaway between Facebook and Twitter (Facebook on Tuesday and Thursday; Twitter on Wednesday and Friday). To participate, simply check our feeds on the days noted above and post by 3:00 PM (EDT). We'll draw winners between 3:00 and 6:00 each day. Be sure to provide your WarcraftPets username. If you are one of our lucky winners, we'll send your key via the email address bound to your WarcraftPets account. 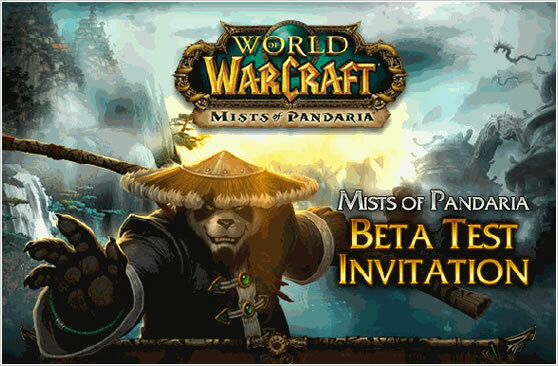 Our official email will include an actual beta key (not a beta invite) as well as your WarcraftPets username. We will NOT include any links in our email, nor will we request any additional information (such your password). CAUTION: If you receive anything other than what we described above, assume that it is malicious. As always, we urge you to exercise caution when you receive any email regarding WoW that includes external links.